These are indeed exciting days to be at the Lodge! We generally expect to see some big fish through this period and we’re happy to say that all is right in the world of QCL fishing. If anything we may be a little behind “normal” timing but that’s working out just fine. QCL guests are seeing lots of opportunity to pick and choose the fish they keep and which they release. 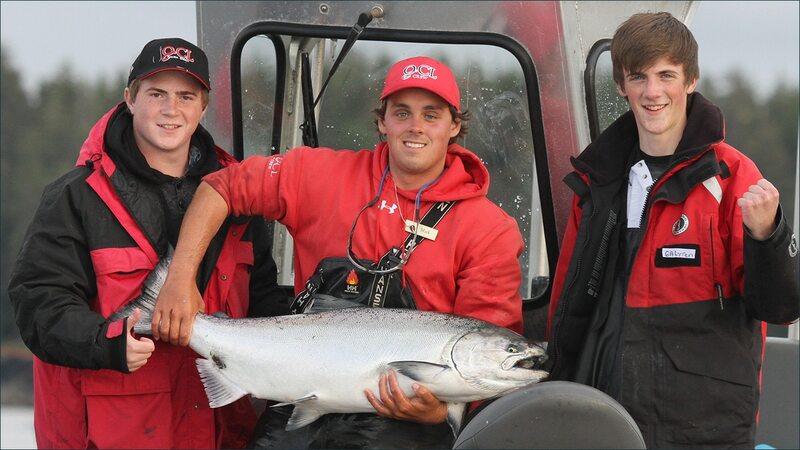 As a result we’re releasing lots of beautiful big Chinooks! We encourage anglers to make an informed choice about the fish they keep and we really like to see those big Tyees go back in the water. Of course, sometimes that doesn’t always happen for one reason or another and that’s okay too. In the past week we’ve seen 39 Tyees released by 27 different guests with 21 different guides. There were 29 fish over 30 pounds, 8 over 40 and 2 over 50. And that’s just the releases! 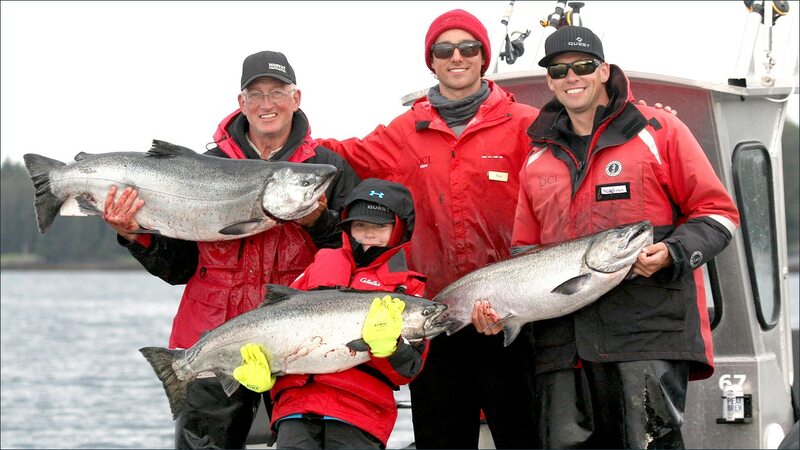 Chinook fishing has been very good. Some particularly notable achievements were Justin H., fishing with guide Coady Delesalle, who turned back 33 and 51 pounders. Mike K joined the 50 Pounder Club as well with a big beauty that couldn’t go back and was weighed in at 56 lb.by his guide Kyle Hedican. 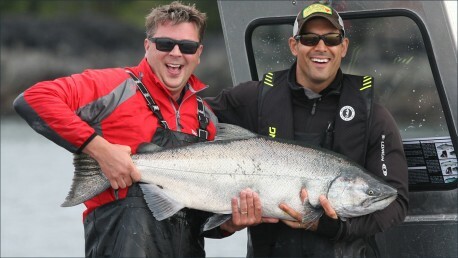 Grant H was able to release a big silver slab that was taped out to 47 pounds by his guide Nick Mercer. 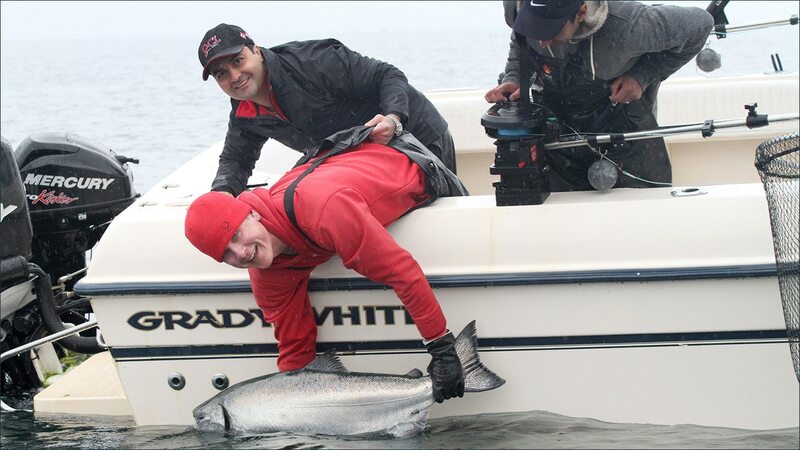 David A and his guide Oliver Schmaler caught and released 3 Tyees during his stay – 33, 38, 38 lbs – while boatmate Jamie P kept a 31 and released a 37! How awesome is that? The Lever brothers, making their first sojourn to Haida Gwaii from Ontario have enjoyed phenomenal success over the week with veteran QCL guide Dan Rainville, releasing 31, 33, 39 and 42 pound Chinooks! Of course we can’t forget the stunning 78 pounder that Trevor M caught and released with his brother Brad while fishing with Robbie C. An encounter with a fish like that is something that leaves you speechless, in awe of what just happened. Seeing it swim away with such strength and drive is so encouraging. Congratulations to all of you on your success! Halibut catches over 30 pounds have tailed off a bit with anglers committing more of their time to salmon fishing this week! Winds from the northwest have kept the effort a little closer to shore these days so anglers are often keeping their first fish and getting back inside. That said, we have still recorded 5 more fish over 100 pounds this week with a 121 pounder for Jay SL being the largest. Most fish boxes this week contained a couple of nice 15-20 pounders. Coho numbers are increasing slowly with average size being 8-10 pounds and a few 12-13 pounders showing up each trip. For the fly-fishing crowd, it’s definitely time to pack that 8-weight when you’re coming up here! Looking forward to the weekend we can expect light winds out of the south to southeast and very mixed skies – typical island weather, clouds, showers, sunshine, repeat! The huge tides we experienced last weekend will have mellowed to changes of 6 to 8 feet by Saturday so it should be a very active weekend! We can’t wait!